One of the problems with the pricing structure of American carriers is that people who buy their phones outright don't get any kind of break on the service plans themselves, giving people fewer incentives to get away from subsidies. T-Mobile has addressed this (by essentially throwing out subsidies all together), but today AT&T fires back with the new Mobile Share Value Plan. Basically it's a $15 discount if you buy a phone unsubsidized, including the new AT&T Next plans, or if you've already paid off your on-contract device. New customers can choose the Mobile Share Value Plan when they bring a phone to the service (like, say, a Nexus 5), purchase a new phone outright, or start an AT&T Next plan (which carries its own zero financing monthly charges). If you're a current AT&T customer who's still on a contract from buying a subsidized phone, you'll have to wait until the contract ends, then manually switch to a Mobile Share Value Plan. Unlimited talk and text is included with all plans, and data starts at 300MB for the basic $45 a month plan ($40 with a "dumb" phone) all the way up to 50GB a month for a whopping $400 a month. Prices start at $40 a month for unlimited talk/text and 300MB if you bring an unsubsidized "dumb" phone or sign up for Next. Add $5 a month for a smartphone, and another $15 a month if you want a standard subsidized device. Simple! There's also a slightly adjusted AT&T Next plan to choose from, with a new upgrade option starting at 18 months instead of 12. It will spread the phone payments over 26 months instead of 20, making each month-to-month payment slightly smaller in return. The 0% financing remains intact, and customers will still have to pay the full remaining balance if they cancel service early. AT&T's service is still quite pricey even compared to national competitors, and there's no option for unlimited service like some of us were hoping for. But at least those who decide to bring their own device will get a break on the bill every month. The new Mobile Share Value Plan and the extended Next plan will be available starting this Sunday, December 8th. AT&T’s* new Mobile Share Value® plans will make it even easier for customers to share data and save money while enjoying the nation’s fastest and most reliable 4G LTE network.1 Beginning Dec. 8, new and existing wireless consumer and business customers will have the option to choose from new Mobile Share Value plans. The new plans offer customers more savings and provide ‘No Annual Service Contract’ options. It’s never been more affordable to get on the nation’s fastest and most reliable 4G LTE network. For only $45 a month, smartphone customers can now get unlimited talk and text plus 300MB of data.3Qualifying smartphones can be added to any Mobile Share Value plan for $25 more a month per phone; tablets can be added for $10 more per device. The new Mobile Share Value plans make it easy for customers to manage their data without needing to keep track of multiple plans. Consumers, Individual Responsibility Users (IRUs), and Corporate Responsibility Users (CRUs) have different options to stay informed about their data usage and can check it anytime online through the my AT&T mobile app, or by dialing *DATA# from their mobile phone. AT&T also sends courtesy alerts to customers nearing their data allowance for the month. All plans include access to AT&T’s nationwide Wi-Fi network at no additional charge. 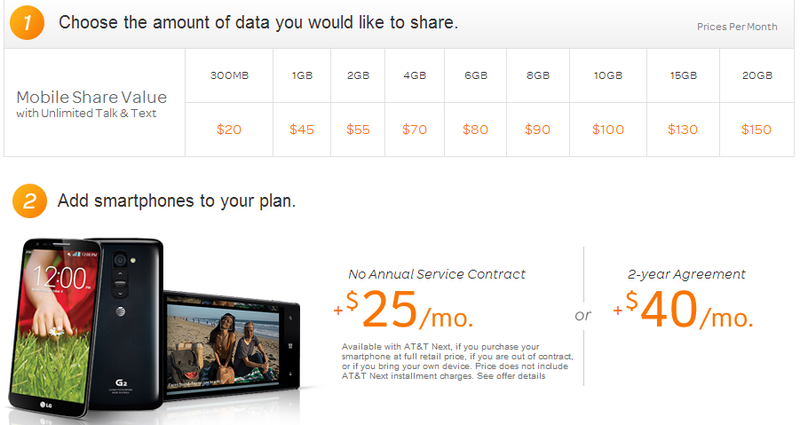 Customers can learn more about the new plans and determine which plan is best for them at www.att.com/mobilesharevalue.